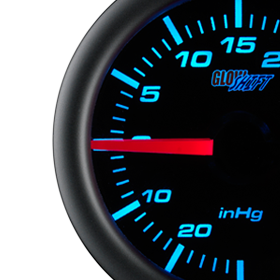 GlowShift Gauges is proud to introduce all new 3in1 Combination Gauges that were designed specifically for gas applications! 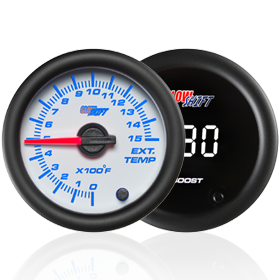 Our new 3in1 gauges feature your choice of a black or white face analog boost/vacuum reading from -30 inHg to 30 PSI, as well as featuring two blue digital readings which include both pressure and temperature readings from 0 to 150 PSI and 68 to 302 degrees Fahrenheit. 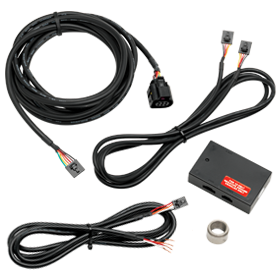 The included electronic pressure sensor can be installed to measure either your oil or fuel pressure statistics and the electronic temperature sensor can measure either your oil, water or transmission temperatures with unrivaled accuracy directly from each source. 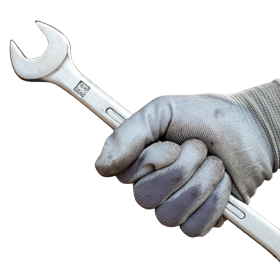 The boost/vacuum sensor allows you to tap into your boost and vacuum lines and precisely measures your vehicle’s compression levels. What really makes this gauge unique is the 10 Color through dial lighting that allows you to select from 10 different colors to match your vehicle’s factory dash or to add a unique, aftermarket style to your car. Modular connectors make installing and connecting wiring to the back of the gauge extremely easy and the 3in1 combo gauge can even be installed to your dashboard with the included 60mm mounting cup! 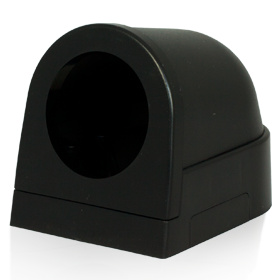 You can also mount the 3in1 gas gauge directly to the A-pillar for easier visibility with one of GlowShift’s vehicle specific 60mm pods. Also available is a black face metric version that features an analog boost reading from -1.0 to 2.0 BAR PSI with two blue digital pressure and temperature readings from 0 to 10.0 BAR PSI and 20 to 150 degrees Celsius. 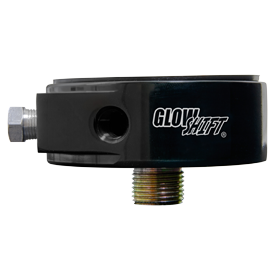 GlowShift includes all necessary mounting hardware, installation instructions, free lifetime technical support and a one year limited warranty with each 3in1 gauge purchased.